Every now and then, something as off-the-wall as Oisin Leahy Furlong’s moniker, THUMPER, comes along and restores your faith in the inventiveness of young musicians. The latest offering from Leahy Furlong’s project appears in a barrage of cataclysmic sound, kicking down the door and cranking the volume to 11. While ‘Pop! Goes The Weasel’ may not be the best thing you listen to this year, it will certainly one of the loudest. The third EP from THUMPER is a menagerie of sound, ranging from brash, distorted instrumentation to softer, more melodic sounds. 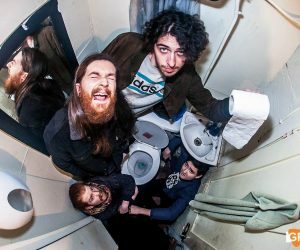 THUMPER have been making waves on the live circuit for their high octane shows and were even featured here on GoldenPlec back in January as part of our Plec Picks. Boisterous tracks populate the first half of the EP, with the closing two showcasing an entirely different side to THUMPER. It’s like getting to know that person that kind of seems like a loud-mouthed jerk but when you get to know them, you discover they’re pretty soft on the inside. The entirety of opening track The Loser is possibly distorted just a bit too much, but while it struggles through speakers, it really shines through headphones. The hook of “I am a loser baby/lose yourself with me” is contagious and Leahy Furlong’s vocals deliver it with complete conviction. The Circles has a very similar distorted style but it doesn’t really shine in the same way that it’s predecessor managed to. The Part That I Always Leave Out kicks the intensity down a notch, letting a rhythmic bassline and soaring guitars lead the track instead of brash distortion. This is a welcome change but as well as that, it also illustrates a versatility and proves that Thumper aren’t a one trick pony. However, the real gem in the selection of tracks is Fear of Art, a six minute long barrage of psychedelic fuzzy rock goodness. As a song, it is by far the most refined and structured on ‘Pop! Goes the Weasel’. At the tail-end of a breakdown juxtaposed between two explosions of sound, Leahy Furlong delivers lyrical analysis, wrapped up with “I insist that I’m a little different/but everyone knows I amn’t” before an astronomical kick back in to wrap the track up. For a band with as much live presence as THUMPER, it was always going to be difficult to capture that on a record. ‘Pop! Goes The Weasel’ succeeds in showing off a broad spectrum of just what you can expect from the band. But lads, a word of advice. If you’re going to go and see them live, bring earplugs and possibly a helmet. When I See You ... Ice Cream!